"" Read more : http://www.ehow.com/how_8339780_put-emoticons-blogger.html WillowRaven Illustration & Design Plus: The Weapon Snitch and the Crown of Blood, by KE Moore (@Weaponsnitch) ~ cover art and design. 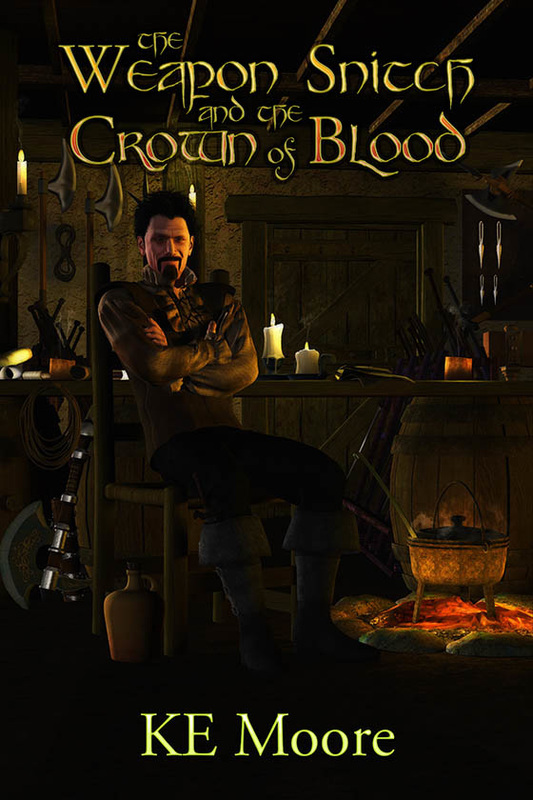 The Weapon Snitch and the Crown of Blood, by KE Moore (@Weaponsnitch) ~ cover art and design. Ever hear of a Weapon Snitch? I never did until KE Moore came to me with this project. From the little I read, the Weapon Snitch is a very interesting character. So I thought the cover had to be just as interesting. :D Any guesses based on the cover? In a world where there is just a little more magic than our own and brave heroes still go on daring quests, the Weapon Snitch is one of the most important people on the planet. Not that most people know this, of course; he’s far too important to be famous. But whenever there is a stone that needs a sword thrust into it, a wretched troglodyte in need of a ring of power, or a magic wand that needs to collect dust in the perfect spot until its chosen master just happens to stumble along at exactly the right time, rest assured the Weapon Snitch will be there. For it is the destiny of the Weapon Snitch not to partake in adventures, but instead to ensure that adventures happen. This does attract pretenders from time to time, and Percival Grey, the current Weapon Snitch, is adept at deflecting these would-be heroes and maybe getting a little extra coin or some moonsage for the stew pot in the process. But when a particularly bumbling group of adventurers accidentally hands over a powerful artifact to one of the greatest vampires in the world, Grey, along with his apprentice Marster, must do the unspeakable. They must become part of the adventure. The Weapon Snitch and the Crown of Blood. I've already started laying out the text for an ebook, so as soon as that's done, get ready for an adventurously fun read. Be sure you are following KE on twitter for availability. *Update: Now available on Amazon!